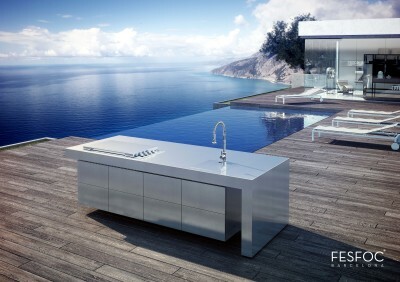 FESFOC outdoor kitchens are guaranteed to be the highlight of any outdoor space with their lustrous, elegant looks and an atypical grill pattern. FESFOC barbecues are thoroughly functional and come in a range of different shapes and sizes to suit your specifications. With either stainless steel or cast-iron grill options, these barbecues are resistant to oxidation and great for haute cuisine. They are also incredibly easy to clean and certain barbecue models can double as a stylish outdoor table when not in use. Internationally considered as a leading brand in innovation, technology and aesthetics, FESFOC barbecues are fully adapted to modern standards, becoming a new concept of outdoor cooking.